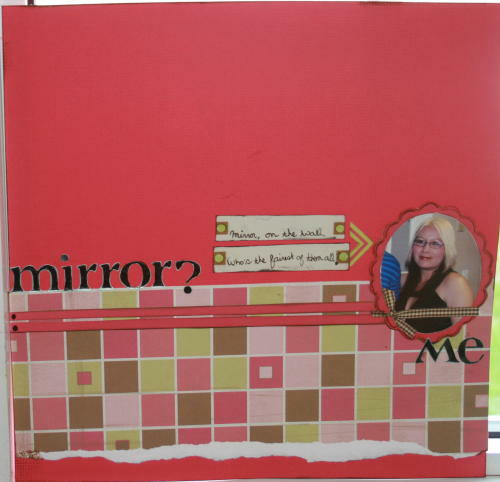 This Storyteller Scrapbooking Kit Layout is titled "mirror mirror on the wall". I kept the design very simple, part of it was because I wasnt really "into" the girl products included in the scrapbook kit...everything else in the kit ROCKED!!!!! I trimmed a piece of patterned paper, then ripped along the bottom edge.I cut the mirror looking diecut out, glued my picture to the back of it, and trimmed around it. I cut the ribbon piece from a diecut and added it to the bottom of my picture.